A growing part of my artistic practice, are my portrait pots. Often boldly coloured, with a flat graphic appearance. 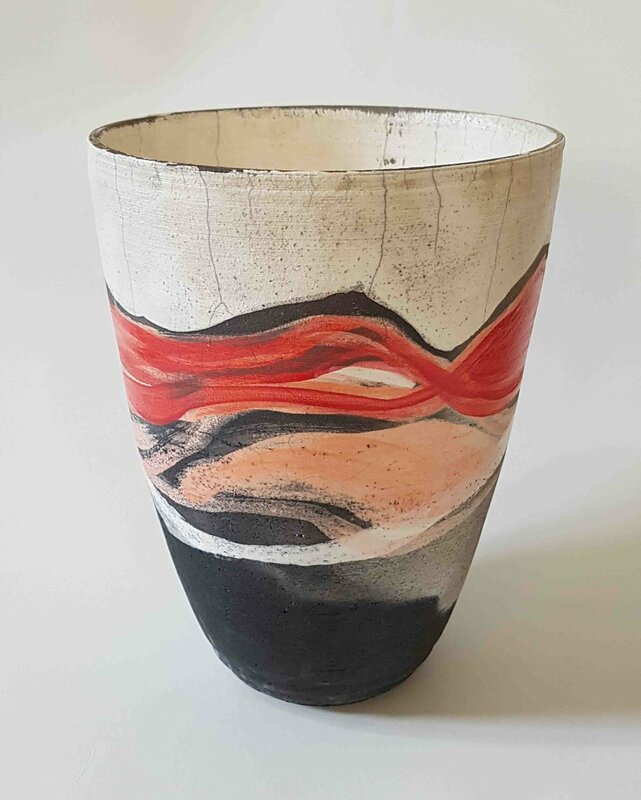 I have always loved the elemental nature of Raku Firing, apart from wood firing perhaps, no other process seems to encompass the immediacy and the elemental nature of Raku. When applied to a portraiture context, the sitter and the form seem to blend. What the pot or platter has endured through the harsh and dramatic firing process, mirrors that which we as people endure in our everyday lives. We grow, experience, gain scars, and learn and live. Some people wear their scars on the outside others bury them, deep. My portrait works often uniquely include cut-outs that act as windows into the sitter, searching for or revealing something beyond the surface, something more complex. It adds to the work as a ceramic object also. A ‘risky’ firing process that can end in failure, is made even more complex, but in a way, far more personalized. Born Australia. Initial training: 2011-2012 Far North Queensland TAFE Ceramics Competencies; 1992 Bachelor of Fine Arts, University of New South Wales, College of Fine Arts. Solo Exhibitions include: 2017 Sur(face) Value, Makers Gallery, Brisbane; 2016 Ridgelines, KickArts, Cairns; 2015 Midnight Horizons, Flying Monkey Gallery, Cairns; 2007 Northern Horizons, Cairns Regional Gallery; 2003 Islandism, Toowoomba Regional Gallery. Group exhibitions include: 2017 Artisan, Brisbane; 2017 Identity, Skepsi @ Montsalvat; 2016 Melting Pot, Cairns Regional Gallery; 2015 Collectable Art, Cairns Regional Gallery; 2014 Blunt Edge of Portraiture, Cairns. Awards: 2016 Highly Commended, Melting Pot, Cairns Regional Gallery; 2014 Winner, Blunt Edge of Portraiture, Cairns. Public Collections: Bendigo Art Gallery, Cairns Regional Gallery; Toowoomba City Council Regional Gallery; University of New South Wales, College of Fine Arts, Clement Semmler Library; University of Sydney, Faculty of Health Sciences, School of Occupational Therapy. Corporate Collections: Blunt Edge of Portraiture Collection, Artbank; Rio Tinto Aluminium, Weipa; Blunt Edge of Portraiture Collection; Tuxworth and Woods Carriers; Rebul Packaging. Work is held in private collections in Australia and overseas, including Great Britain, France, U.S.A., Italy, Canada, Germany and Japan. Artist Residencies: 2011 SACI Studio residency, Florence, Italy; 2006-7 assisted Thanakupi with various public art pieces, Bawtjathi, including appearance in ‘Going Bush 2, episode 5 Cape Crusaders Screened on SBS, 2007; 2002 Queensland Artworker's Alliance, Open Studio, Merivale Street, Brisbane. Published writing includes: “What I love About Raku”, Journal of Australian Ceramics, 2017.